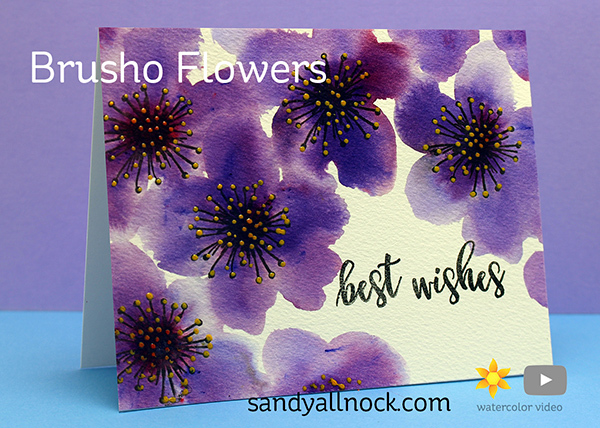 If you want to paint pretty flowers, but need a little nudge – this stamp set has some perfect images to get you rolling along. I’m using Brusho, though you can use other paints – but it’s easier, from my experience, to loosen up with Brusho. Note that though I wasn’t sure in the voiceover, I was using a 12 to get huge petals like this. Watch the video below or click HERE to see it in HD on YouTube. The second card uses the other stamp – but basically the same painting technique. The surface I work on with Brusho is the Craft Assistant – very easy to clean up, and that’s important with watercolor powders! 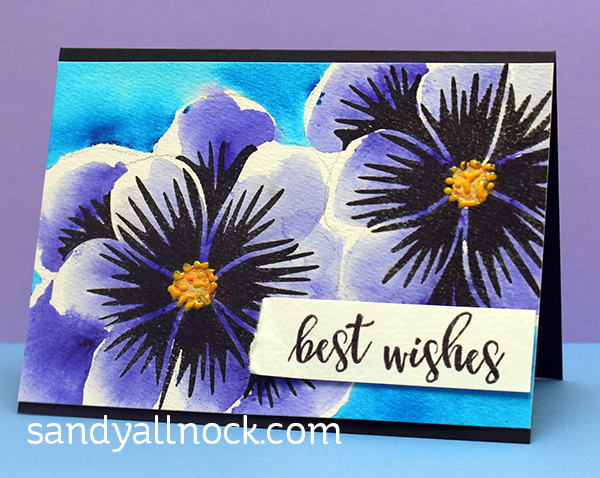 The three colors I used on these cards are Turquoise, Purple, and a little Gamboge. See supply links below. Below are links to the supplies I’ve used for today’s project. Compensated affiliate links may used, which means if you make a purchase I receive a small commission at no extra cost to you. I truly appreciate your support toward the costs of running this blog! Read more. I have three or four of the Ken Oliver Color Bursts but I would like to try the Brusho to compare. There are so many colors, though! Do you have any recommendations if I want to get two, three or four colors? Thanks! Oh wow, these are gorgeous. Will have to give this technique a shot…thanks so much for sharing. These are absolutely stunning Sandy. I wish I had Brusho’s, I have wanted them since I first saw them in action and I love the way they “bloom”. We are ‘gearing up’ today for a Nor’easter and I will have the house to myself tonight so I will be spending some uninterrupted time in my craft room. Can’t wait! Maybe I’ll try your wc technique with some regular wc’s. Wow!! This is amazing!! Love how you created the flower out of a blob of color!! What a treat! I just got my first set of Brushos as well as my first Nuvo Drops, so your timing with this video is amazing! It gives me some not-too-scary ideas for how to approach these two goodies as a real amateur. Thank you so much for your fun inspiration! love both of these awesome cards! Thanks so much for the great video. I can see I need to do some playing with my Brushos! Thank you for making the video! I’ve never seen powder watercolours before…with that said, it’s not surprising since I’m so new to the scene. But I want to try them! Simple image turned out simply elegant! I don’t have any Brusho, but I’ll give it a try with my other watercolors. Gotta get some of those Nuvo drops, though! They really gave the centers of the flowers a lot of dimension. Brilliant technique and beautiful results. Sandy, this is so pretty! You are AMAZING!